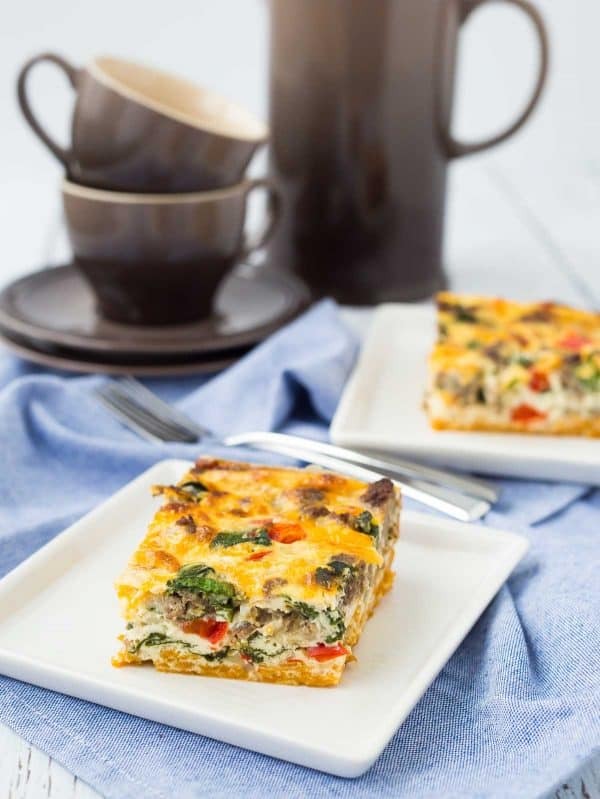 This egg white casserole with sweet potato crust is the perfect make-ahead breakfast! 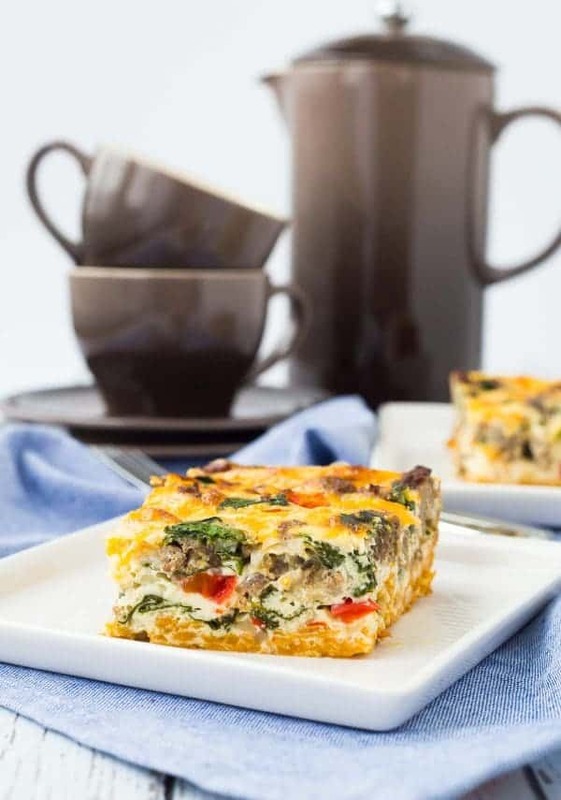 Packed with protein and vegetables, it will keep you full all morning long! Mornings are hectic around here. HECTIC. We live a little ways from school, so it’s rise and shine for my kiddos at 6:30am and we’re out the door between 7 and 7:15. This morning I had to practically drag E out of bed. I usually get up between 4:45 and 5:15 to squeeze in a workout and some work. Breakfast is rushed, everything is rushed. Rushing is the price I pay for refusing to wake the kids up before 6:30am (because we all know I’d pay for that later in the day!). Ben leaves super early for work too – usually before 6:30am. And he comes home after 6pm every day, except when he has meetings/concerts/games, etc – which is two to three nights a week. Those nights he isn’t home until 9:30 or 10. So, in case you parents out there think your school principals don’t put in the hours or work, let me assure you, they do. He’s been known to work many a Saturday too. Sometimes I wish he didn’t have quite the work ethic he does so that maybe we’d see him more often, but I know over 800 kids benefit from that work ethic so I put on my big girl pants and deal with the long hours here at home. Another thing I do to make mornings easier is to prep breakfast on the weekends whenever possible. Sometimes it’s pancakes, but lately I’ve been looooving this breakfast casserole. It’s packed full of protein (turkey sausage! egg whites! cottage cheese!) and Ben and I both love it. It’s inspired by Cookin’ Canuck’s version and we’re obsessed with it. We’ve tried it when it more closely mimics Dara’s recipe, using russet potatoes instead of sweets, and while I love it both ways, Ben prefers it with sweet potatoes. Shredded sweet potatoes make up the crust of this egg white casserole. After I peel and wash the potatoes, I use my food processor with the shredding attachment and the job is done in literally 30 seconds. If you don’t have a food processor or you’re in the mood for a workout, you could use a box grater (I have this one and have no complaints about it). A third alternative is your spiralizer if you have one (I have this one – I’ve tried three and it’s my favorite). I’d use the smallest blade and then give the sweet potato noodles a quick chop with your knife to shorten the noodles. You could easily adapt this to use different vegetables or even a different type of meat (ham would be good!). You could also add bacon or turkey bacon. It would be great vegetarian as well, with extra vegetables. We love spinach, but broccoli would be great too. I’ve made it with mushrooms and it comes out fantastic. The sky is the limit! Shred sweet potatoes, mix with olive oil and S&P. Spread into a greased pan. Prebake the crust a little while you make the filling. Saute sausage and vegetables and put the rest of the filling ingredients in a bowl: Eggs, egg whites, two types of cheese, milk. Mix the cooked sausage and vegetables into the egg mixture. Pour the egg mixture over the pre-baked crust and pop in the oven. BAKE! The only thing left to do is enjoy it or refrigerate it for tomorrow. If you’re not serving this right away, make sure to pop it in the fridge and let it cool down right away. Wait to cover it up until it’s completely cooled, though, or you’ll end up with a lot of moisture from steam gathering and ending up on top of the egg white casserole. PS: 26 grams of protein and 236 calories per serving. BOOM. Breakfast is SERVED. Want to make it Paleo? Leave out the milk and cheese and it still tastes awesome! 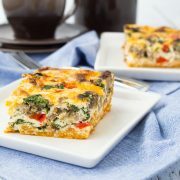 Watch this short video to see how to make this egg white casserole! Preheat the oven to 425 degrees F. Lightly coat a 9×13-inch inch baking dish with cooking spray. In a medium-sized bowl, toss the shredded sweet potatoes with olive oil, salt and pepper. Transfer the potatoes to the prepared 9×13-inch baking dish, pressing down into the bottom of the pan and up the sides if desired. Bake at 425 degrees Fahrenheit for 20 minutes or until golden brown on edges. Turn the oven heat down to 375 degrees Fahrenheit. While the crust cooks, cook turkey sausage in a large skillet over medium-high heat, breaking it up as it cooks. Add bell pepper and green onions and continue to cook for 3-4 minutes or until bell peppers are tender. Add spinach and cook, stirring, until spinach is wilted, 1-2 minutes. In a large bowl, whisk eggs with egg whites and skim milk. 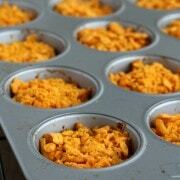 Stir in cottage cheese and cheddar cheese. Stir turkey sausage mixture into egg mixture until combined. When crust has finished cooking, pour egg and sausage mixture over the crust. Cook at 375 degrees Fahrenheit for 45-55 minutes, or until eggs are set. Serve hot or cool in refrigerator and then cover and keep stored in fridge. Note: One time I made this, I forgot to reduce the oven temperature to 375 degrees. Rest assured, it still turned out fine! Just a little crispier around the edges and on the top. Note: If your shredded potatoes seem to have a lot of moisture, use a paper towel or a lint-free towel to wring or blot out some of the excess liquid. Verdict: Making this egg white casserole has become part of my weekend routine. It’s a staple – I love it. 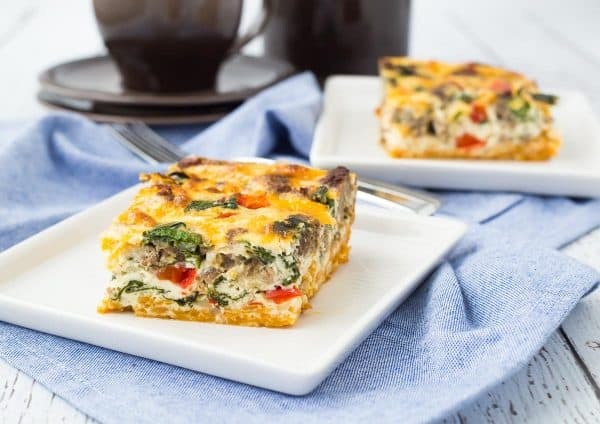 I often work out in the morning so if I don’t make myself a shake, this breakfast casserole is perrrrrfect to give me a boost of protein. Husband’s take: He loves this – no complaints heard! Changes I would make: None are necessary, but as I mentioned, feel free to have fun with different vegetables or even make this vegetarian. This was so so good!! Next time I make this (and there will be a next time), I might even double the sweet potatoes to make a thicker crust. Awesome alternative for a healthy breakfast, brunch, or light dinner! This receipe is a keeper. Thanks Donna! So happy to hear you like it! This is perfect for breakfast! Love the use of sweet potatoes. Breakfast casseroles are a favorite in our family! Thanks Megan! I hope your family loves this recipe! To save time in the morning could you cook this for 20 minutes then refrigerate and finish cooking in the morning? can you substitute the cottage cheese out for something else? So glad you liked it! Thanks for taking the time to come back and leave a comment! Made this today and it’s delicious. Was wondering if you think it could be portioned out and frozen? So glad you like it, Kim! I haven’t tried freezing this, but I think it would work great! Enjoy! Sometimes potatoes change texture when thawed so it might not be exactly the same, though. If you try it, report back and let us know how it went! This looks SO stinking good, and love that it can be made-ahead for breakfast on the go, a low carb snack, or even a light lunch or dinner! Totally saving! Thanks Karly! I hope you love it! 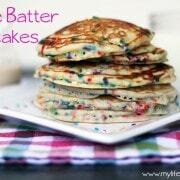 This looks like an awesome breakfast idea!! 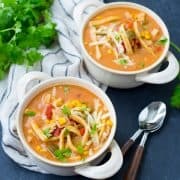 And dinner idea, too :) I don’t know what I’ll do when I have kids since I can barely get myself ready in the morning and always feel like I’m rushing even when I give myself over an hour!